Want to get worse at blogging? Ignore technology. Want to improve? Capture Blogging Ideas Anywhere! No matter your personal opinion on technology, it is here to stay and it’s only getting more convenient. As a Blogger how do you take advantage of it quickly? Incorporate free smartphone apps into your blogging routine with a digital notebook. Investing a small amount of time into this article today will save you a lot of time in the long run and get more traffic to your blog. In our 2017 survey of Irish Bloggers, the number one response was “not having enough time” to blog. This survey consisted of personality brand bloggers, small business bloggers, corporate bloggers and niche site bloggers e.g. fitness, food, parenting etc. Finding the required hours in the day to blog can be a challenging task and if you find it hard to “make time to blog”, then fear not as you aren’t alone. The simple answer to this is to make blogging a priority and schedule it into your diary. As Personality Brand expert Chris Ducker said when he was on our podcast “you don’t find the time, you make the time”. We couldn’t agree more with Chris, because if it isn’t on my calendar then it simply won’t get done. Interestingly, this is not the biggest problem that bloggers are facing today. Many bloggers make the time but are unproductive and waste it. We have all been there. All of a sudden you have a few free hours outside of the day job, the family is out and you think “Brilliant, I am going to get an epic blog post written today”, but it just doesn’t happen. A blogging process will help you create great content consistency. The process for blogging that we use at Content Academy is to capture an idea, research it, search for relevant keywords, write a draft, edit the draft a couple times, proofread and then publish the article. This may sound like a long arduous process but it actually makes creating content much easier because you always know what the next step is. If I have a 30-minute window in my calendar such as this very moment as I am stuck on a flight to London I can make it productive and actually get a step closer to publishing a quality blog post that will get us results. We then sit down and start wondering what should I write about, we generally come up with an idea or two, then we start “researching”, but this is where it become treacherous, research can go from reading an article to watching a video, to checking our social media accounts for relevant content, then all of a sudden we’re looking a “ping pong trick shot” one of our friends commented on. Panic sets in as we realise that our time has dwindled away and with time running out we rush a blog post and hit publish. Great, another average blog post published which gives little value to anyone unlucky enough to stumble across it. The Technology Problem: Bloggers Ignore the available free Apps to make blogging faster! Bloggers need to make the most of the resources available to them, in this instance, it’s time, process and technology. This next section will focus on setting up technology with a simple process to help your blogging. With the proliferation of Smartphones and free apps, you can capture information anywhere. The applications we use for Content Academy are Microsoft OneDrive, Microsoft OneNote (both free), the hardware used is my smartphone or laptop with a simple six step process to go from having a blog idea to a published blog article. Let me Show You How to Capture Idea’s Anywhere using a Digital Notebook. Step 1: Go to www.onedrive.com and setup a free account. Step 2: Create a OneNote notebook online within your free OneDrive Account. Think of each of these sections as their very own A4 Pad, where you can add as many pages as you like. Step 4: If you have Microsoft Office, click Open notebook in OneNote and this will connect your local desktop app to your cloud-based digital notebook and keep updated no matter where you up it from. Step 5: Download “OneDrive” to your smartphone and sign in with your account credentials. Step 7: Go to your OneDrive App and open your notebook, click the option to open with the OneNote app. Access and Update your Digital Notebook Online and Offline!! What is also brilliant about this setup for bloggers is that you can update the digital notebook offline and it synchronises when you next get connectivity. As mentioned earlier I am currently at 30,000 feet flying over Wales on my way to London as I type this sentence. Everywhere we go we take our smartphone, I even take mine to the beach when on holidays. This means that as inspiration hits me for a blog post, I can simply open OneNote and add the idea to the “Ideas” section within my digital notebook. No need to try to remember the idea, let’s face it I would probably forget it anyway. This now means that the next window that I have scheduled to blog, I will have a collection of ideas that I can start working on. If you don’t need to do research or would rather look for keywords after writing the first draft that is ok. Getting to a first draft written with your limited time is much better than wasting it coming up with ideas and running out of time to write. Using a digital notebook will help bloggers save time and get more traffic. This is only one small part of the 30 Minute Blogger Series, which has six modules and over 20 topics on helping bloggers save time along with increasing their traffic. 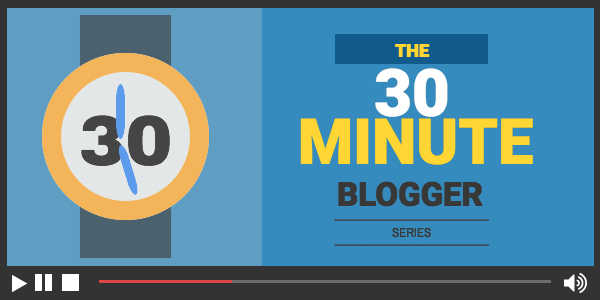 You can get free access to the “30-Minute Blogger” by leaving your details below.